The images from the McQueen exhibit look amazing. Was it super spooky? You and the GOGH girls looked great at the wedding in Boston. Love it when you guys get together. Can we expect a new album anytime soon? My weekend was awesome. Jeff and I went to a wedding for one of his former co-workers on Saturday morning and I have to say, it was my first DC wedding. That's right, I've never been to a wedding in the District. Vermont to Georgia and everywhere in between, but never in DC. It was fantastic. The wedding was at 11:30am, so we had a nice leisurely morning and then took the Metro to the service at the New York Avenue Presbyterian Church which has lots of history (Abe, Martin, Dwight). Very cool. The reception was at the National Women's Democratic Club in Dupont Circle. More awesome history. For my first, it was a VERY DC wedding! #1: Try to buy produce that is in season in my region. This is hard because, well... I'm not a farmer and I don't know what's in season. Luckily as with most conundrums in my life, Etsy has a solution. 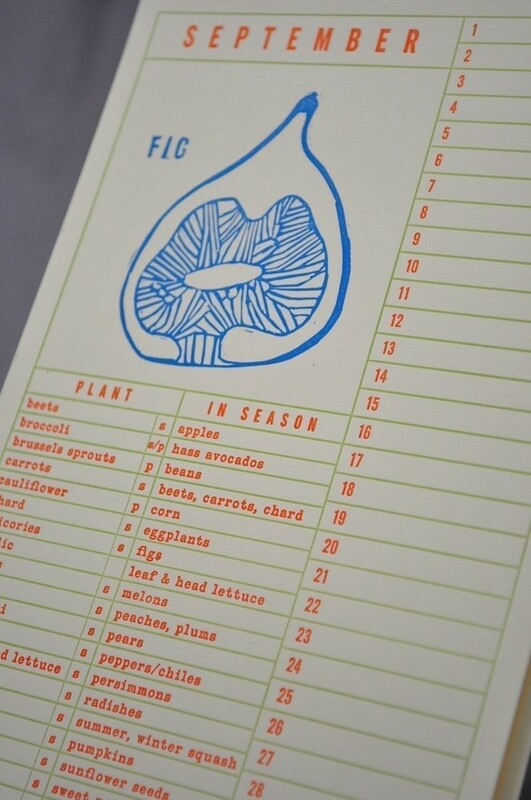 I purchased a perpetual gardening calendar from Krank Press a few months ago and it's been so helpful. Krank has calendars for different regions around the country (looks like she's sold out of Mid-Atlantic right now) and I think it's a fun and beautiful way to help remind me what I should be eating. The calendar has a list of what to plant each month in your region and what to eat. SO helpful and more importantly, NOT overwhelming! #2: In one of the books I read there was a list of the "Dirty Dozen". This list names the 12 types of produce that contain the most pesticides and thus you really should buy organic if you can. I think this is so helpful because while Jeff and I believe that spending money on what we put in our bodies is a legitimate expense, organic can still be really expensive and $12 grapes are not in our 2011 budget. So here's the list I've been sticking to lately of what to absolutely buy organic if I have a choice, and for everything else, I buy organic if it's not cost-prohibitive. And here's a printable Shopper's Guide. Next on the list for Fall... join a CSA. I'll keep you posted! and as I always tell my cuz...for us women it is really important to buy organic dairy whenever possible (to avoid those hormones!). I lose sleep over these questions too. I found that a CSA more or less solved the problem for me in Chicago because I did not have to think about organic or local -- the CSA satisfied both. Of course, I still supplemented with decidedly non-local things (couldn't give up bananas), but I tried to do so thoughtfully. And I also tried to follow the Dirty Dozen rule too, because buying all organic is simply cost prohibitive! In Nepal we definitely live more by the seasons. Want avocados in the summer? Too bad -- they are not available. I have gotten used to a smaller produce selection, but wow, what I would not give to hop into a Whole Foods every once in a while. You would probably find me facedown in the salad bar. Claudine, So glad you had success with a CSA. I can't give up bananas either and from what I understand it's basically impossible to get sustainable bananas. They are just so easy to throw in your purse. I always have one on hand! Thanks to your pomegranate post, I'm excited for Fall pom season!